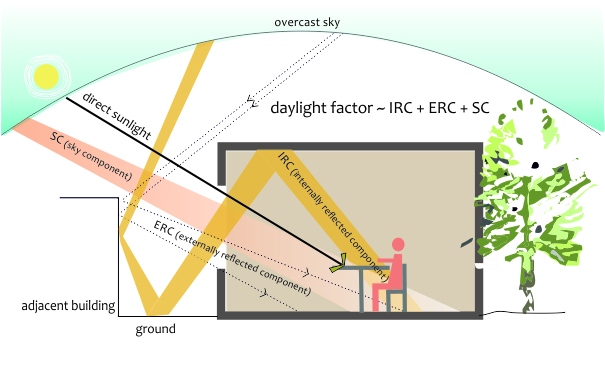 Daylight factor is used for determining daylight. It is equivalent to the sum of the diffused skylight (SC), internally reflected light (IRC) and externally reflected light (ERC). Quality and quantum of daylight entering a space can be controlled by modifying these three factors. Daylighting is a building design strategy to use light from sun. Presence of natural light in an occupied space brings a sense of wellbeing, increases awareness of one’s surrounding and also increases energy saving potential with reduced dependence on artificial light. Appropriate use of windows, skylights, clerestories, and other apertures in the building provide means to harvest daylight. Remember that, more the sunlight that enters the building, more the heat that needs to be dealt with. Thus, by placing apertures correctly, nature can work with you. Integrating daylighting with artificial lighting can considerably reduce energy consumption, but at the same time may lead to higher air conditioning loads due to heat gain. Thus design consultants and decision makers need to appropriately balance daylight harvesting features and minimize solar heat gains. Hence, daylighting becomes an integral part of a building design strategy from early design phase to lower the energy consumption of a building, imperative to advance NZEB design goals. Sidelighting is the most common method of allowing daylight into the building. Glare from direct sunlight can be prevented by using light shelves. These shelves redirect the light rays toward the ceilings which in turn reflect uniform, indirect light. Buildings can be located and oriented to take advantage of sun’s movement throughout the day, as well as seasonal variations. Buildings that are longer on their east-west axis are better for daylighting and visual comfort. Larger and taller buildings should have thinner profiles to maximize daylighting potential from side windows. Large buildings can get daylight into more spaces by having central courtyards or atria, or having other cut-outs in the building form. Focus should be given to maximum daylight factor, increase uniformity of light spread, reduce glare, and minimise solar gains. Increasing the height of each storey to allow for higher windows also helps pull daylight further into the building. Plan for daylight by minimising floor plate depth, especially in office buildings. Amount of daylight that enters a room depends on the window location and its dimensions. Determine the window size, height and glazing treatments for each facade separately. Maximize southern exposure and optimize northern exposure. North-facing windows provide consistent indirect light with minimal heat gains. Minimize eastern and western exposure when the sun is lowest and most likely causes glare and overheating. They are more difficult to shade because the sun is closer to the horizon. There is a direct relationship between the height of the window head and the depth of daylight (Typically adequate daylight will penetrate one and one half times the height of the window head). Allow daylight penetration high in a space. Windows located high in a wall or in roof monitors and clerestories will result in deeper light penetration and reduces the likelihood of excessive brightness. Use advanced daylight harvesting methods in case of large window area (such as use of external light shelves, light tubes, a higher ceiling height and other similar technologies, would help to distribute the daylight deeper into the building). Use skylights and roof monitors to areas without easy access to windows. Use of light coloured interior surfaces reduces luminance contrast and improves coverage. Top lighting is an effective daylighting solution for wide buildings where side lighting cannot be used for adequate lighting of the deeper areas of the floorplate. To reduce glare, skylights must be designed with reflective surfaces that redirects direct sunlight into the space. Design of direction specific skylights must take in consideration angle and path of sun during winter and summer. North facing skylights are most suitable for work spaces. South-facing windows are the easiest to shade. Horizontal shading devices are most effective as they can block summer sun and admit winter sun. East- and west-facing windows are best shaded with vertical devices, but these are usually harder to incorporate into a building, and limit views from the window. The provision of glare protection devices will reduce the amount of daylight harvested. A balance between glare protection and daylight harvesting needs to be done carefully to ensure that the design of the daylight harvesting system will perform as intended. Guide for daylighting schools (2004) a comprehensive brochure addressing key design considerations for using daylighting in schools. Littlefair, P. J. (1991). Site Layout Planning for Daylight and Sunlight: a guide to good practice, Building Research Establishment. Building Research Station. Architectural physics: lighting. London: H.M. Stationery Off, 1963. American Institute of Architects (AIA). Best Practices. Design Process. Lam, William. Sun lighting as Form giver for Architecture. 1986. Little fair, P.J. (1990). Innovative daylighting: review of systems and evaluation methods. Lighting Research and Technology 22(1), 1-17. Radiance is a suite of programs for the analysis and visualization of lighting in design. Velux Daylight Visualizer is a validated simulation and visualization tool for daylighting design and analysis. It is intended to promote the use of daylight in buildings and to aid professionals by predicting and documenting daylight levels and appearance of a space prior to realization of the building design. Dialux can calculate electric light, daylight and the energy performance of electric light. Daylighting is the one of the cornerstones of energy efficient building designs. Several studies have proven the benefit of daylighting, linking it to higher comfort, productivity, and feeling of well-being in schools, offices, and hospitals. An appropriately designed daylighting features will provide better indoor environmental quality, improve building occupant performance and reduce the building’s energy consumption at the same time. Daylighting can significantly impact the energy use of a building by reducing the lighting energy demand by up to 20-30%. NZEBs, which must be designed for 100% daylight potential, can virtually eliminate daytime lighting energy use in most spaces. The resulting saving in lighting energy use also reduces cooling load while providing a better work environment.